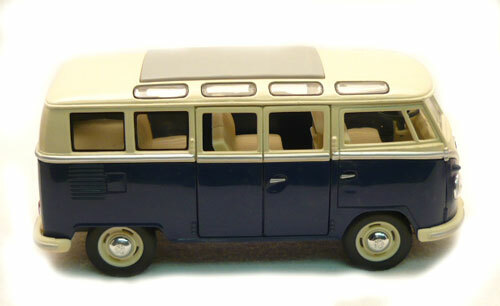 Our 1962 Volkswagen Bus is a 1:24th Scale by Kinsmart is a must for you VW collectors. It has a detailed tan interior with three bench seats and black floor. The side doors open on this free wheeling classic Van. This VW Bus has stock chrome moon hub cap, tan wheels and black wall tires. = 7” Long x 2.75” Wide x 3” High. = The shipping weight is .75 lbs.